Union and Confederate soldiers fought for three days on the bloody fields of Gettysburg, Pennsylvania. While the Union could call this battle a victory, nearly 8,000 Americans died. The enormous loss of life prompted President Lincoln to dedicate a cemetery at Gettysburg on November 19, 1863, and give his legendary Gettysburg Address. This Union victory, more than any other battle of the war, ended the Confederacy’s hopes for foreign aide and shattered General Lee’s image of invincibility. 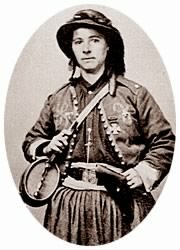 Vivandieres were women who served in the Civil War by traveling with the army as cooks, nurses, mascots, and soldiers. Marie Tepe belonged to this class of women and fought at the Battle of Gettysburg. Born in France in 1834, she immigrated to the United States and married a tailor in Philadelphia. When the Civil War broke out she joined the military with her husband and served with the 27th Pennsylvania Infantry, Co. I and 114th Pennsylvania Infantry. At the Battle of Fredericksburg she was shot in the ankle, after the Battle of Chancelorsville she received the Kearney Cross, and at the Battle of Gettysburg she nursed the injured for weeks after the three-day conflict. Many of the men called her “French Mary”, but whatever her name, this courageous woman served her country at a time when staying out of the battle was easy and accepted. Hundreds of women served on both sides during the Civil War, and the service by these Vivandieres will never be forgotten by the soldiers whose lives they saved.